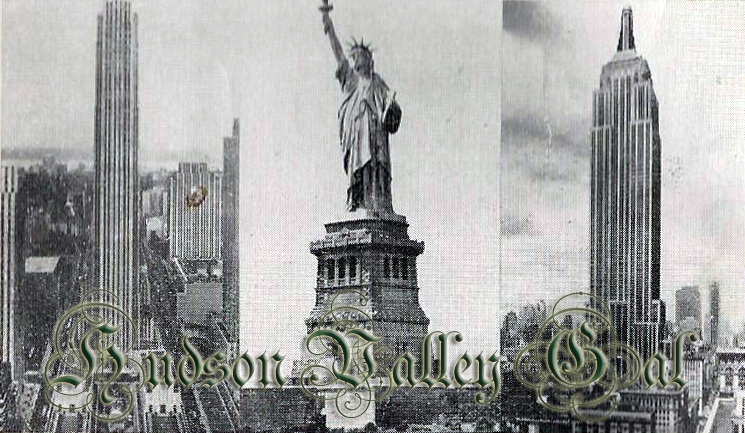 Our Time at Foxhollow Farm is a remarkable pictorial history of an eminent Hudson Valley family in the early decades of the twentieth century. Illustrated with the family’s extensive collection of personal albums compiled during the nascent years of photography, it provides a fascinating insight into the regional, social, and architectural history of the era. In 1903 Tracy Dows, the son of a successful grain merchant from Manhattan, married Alice Townsend Olin, whose Livingston forebears had settled in the Rhinebeck, New York, area in the late 1600s. Dows purchased and combined several existing farms to establish his estate, Foxhollow Farm, next to Alice’s ancestral home. He commissioned Harrie T. Lindeberg, a sought-after architect trained under Stanford White, to design the family home and other buildings on the property, and the Olmsted Brothers to landscape its rolling hills. The Dowses raised their three children on the estate, and led a busy social life of tennis tournaments, weddings, dinners, and dances with such friends and neighbors as the Roosevelts and the Astors. Tracy Dows devoted himself largely to the pursuit of agricultural and civic affairs at home and in the Rhinebeck community. Olin Dows, Tracy and Alice’s son, became a notable painter active in President Roosevelt’s Works Progress Administration. Our Time at Foxhollow Farm follows the Dows family from 1903 through the 1930s, documenting their life at home, social activities, and travels in America and Europe. An enthusiastic amateur photographer, Tracy Dows took many of this book’s photographs himself, offering a vivid and warmly intimate perspective on privileged early twentieth-century American life. This entry was posted in Books and Publications and tagged Books, Dutchess County, Foxhollow Farm, Livingstons, Rhinebeck on October 19, 2016 by hudsonvalleygal. Hudson River towns have (or had) an abundance of row houses. This fascinating study is the first to examine the transformation of residential architecture in New York City in the early 20th century. In the decades just before and after World War I, a group of architects, homeowners, and developers pioneered innovative and affordable housing alternatives. 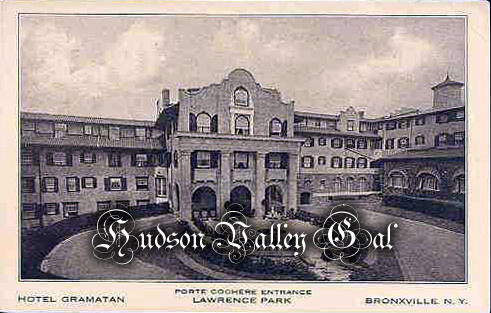 They converted the deteriorated and bleak row houses of old New York neighborhoods into modern and stylish dwellings. Stoops were removed and drab facades were enlivened with light-colored stucco, multi-colored tilework, flower boxes, shutters, and Spanish tile parapets. Designers transformed utilitarian backyards into gardens inspired by the Italian Renaissance and rearranged interior plans so that major rooms focused on the new landscapes. This movement—an early example of what has become known as “gentrification”—dramatically changed the physical character of these neighborhoods. It also profoundly altered their social makeup as change priced poor and largely immigrant households out of the area. Dolkart traces this aesthetic movement from its inception in 1908 with architect Frederick Sterner’s complete redesign of his home near Gramercy Park to a wave of projects for the wealthy on the East Side to the faux artist’s studios for young professionals in Greenwich Village. Dolkart began his study because the work of these architects was being demolished. His extensive research in city records and contemporary sources, such as newspapers and trade and popular magazines, unearths a wealth of information detailing the transformation of New York’s residential neighborhoods. This significant development in the history of housing and neighborhoods in New York has never before been investigated. 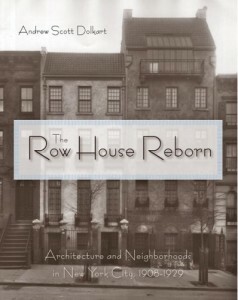 The Row House Reborn will interest architectural and urban historians, as well as general readers curious about New York City architecture and neighborhood development. 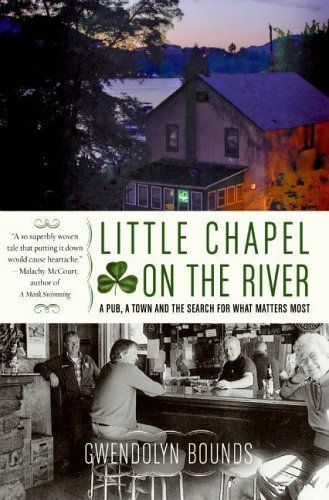 This entry was posted in Books and Publications and tagged Andrew S. Dolkart, Architecture, Bibliophile, Gentrification, New York City, Row House Reborn on July 6, 2014 by hudsonvalleygal. Corner Stone laid by Governor Alfred E. Smith, October 11th 1925. Length, 3,000 feet Main span, 1,500 feet. Shore span, each, 750 feet Poughkeepsie approach, 1,100 feet. The Poughkeepsie approach consists of three small bridges over two streets and the New York Central tracks. The Highland approach cut will consist of a twenty-foot concrete highway, the length of which will be a mile and a quarter. 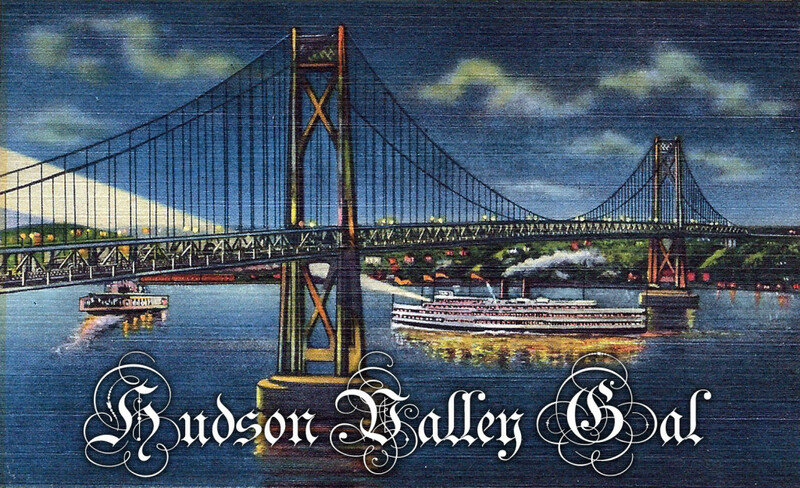 This entry was posted in Mid-Hudson Bridge, Poughkeepsie and tagged Hyde Park, Mid-Hudson Bridge, Postcards, Poughkeepsie, Ruben Publishing on July 3, 2014 by hudsonvalleygal. This entry was posted in Amusements, Parks, Rye and tagged Amusement Parks, Central Amusement International, National Register of Historic Places, Rye, Rye Playland, Westchester County Parks on June 29, 2014 by hudsonvalleygal. 300 miles north of New York City, up in the Adirondack Mountains, a tiny stream trickles southward through fragrant spruce and pine trees. This is the beginning of the Hudson River. Gathering force and volume on its downward course, it emerges at Albany as a well defined river and continues south into New York Bay. Along the banks, nature lavishly shows itself in stupendous rocky cliffs, picturesque waterfalls and towering mountains, while man’s achievements dot the shores in far flung bridges, historic mansions, palatial castles and huge industrial works of many kinds. As long as people are people, a boat ride on the legendary Hudson River will have die same magical appeal. It has cast its spell over many generations of Americans. Every year it calls to thousands of young and old who dance, dine and play on the broad and leisurely decks of their favorite Hudson River Day Line Steamer-the Robert Fulton, the Alexander Hamilton or the Peter Stuyvesant. A trip on the Day Line is a favorite American institution. Its thrills are known to all. It is a unique entertainment experience, bound up with amiable traditions and sentiments of good fellowship. It is the only way to become acquainted with America’s most beautiful river. Whether for commerce, or for history, or for folklore, or for just good looks, the Hudson is pretty hard to beat. Taken altogether, the combination is unsurpassable. 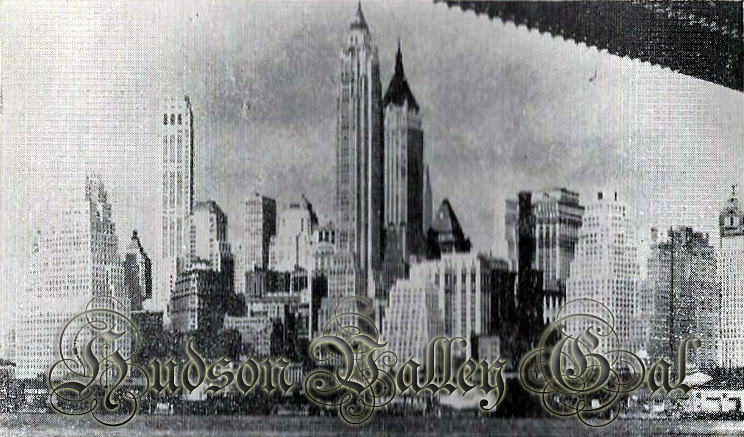 It is the Hudson which has made New York City what it is—the greatest seaport in the world. The heroism of George Washington, the treachery of Benedict Arnold, the antics of Washington Irving’s immortal Rip Van Winkle and Ichabod Crane, the busy whirr of business, of Fulton-Vanderbilt steamboat wars and the color and tradition of the 129-year old Hudson River Day Line—these and many other dramas have been played against the Hudson’s handsome and picturesque background. 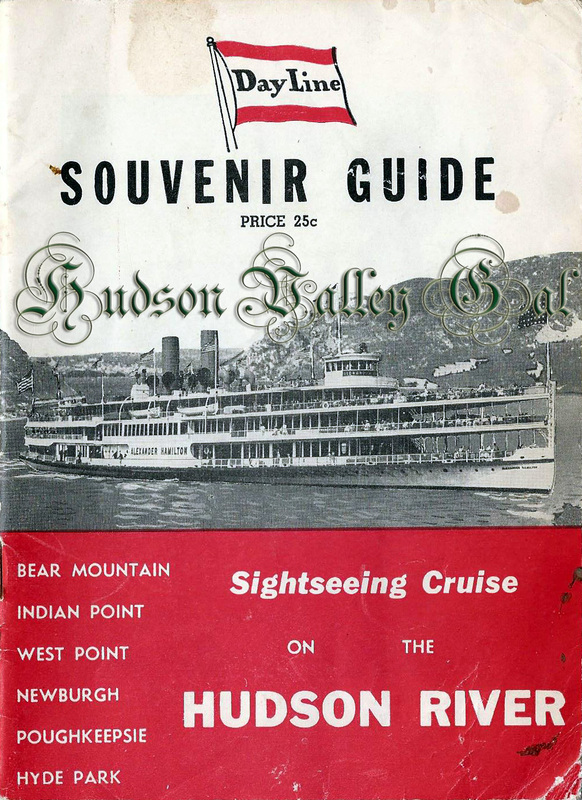 This entry was posted in Hudson River Day Line, Ships and Vessels and tagged Day Line Souvenir Guide, Hudson River on November 6, 2013 by hudsonvalleygal. Hachaliah Bailey purchased an African elephant in 1815 and set upon the countryside to make his fortune. Menageries were an early form of American entertainment; but unfortunately, a disgruntled Somers farmer shot Old Bet and brought to a close Bailey’s preBarnum activities. The monument, originally erected by Bailey and later restored, stands in the center of Somers, which considers itself “The Birthplace of the American Circus”. This entry was posted in Amusements, Somers, Westchester County and tagged Barnum and Bailey, Circus, Elephants, Oblong of the Hudson, Somers on July 18, 2013 by hudsonvalleygal. 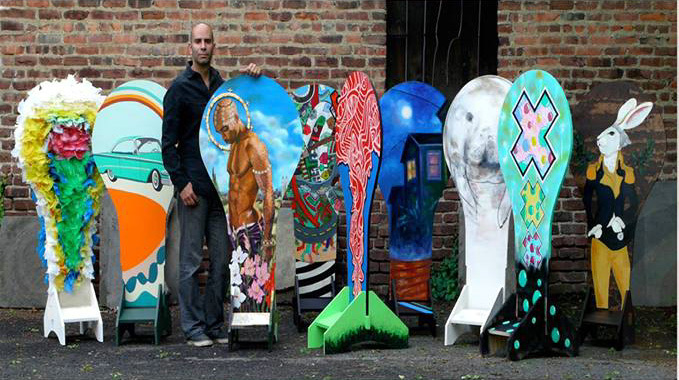 A Newburgh Illuminated event featured over 52 ARTISTS creating an eclectic & unique collection of public art! Engage with 52 4 foot light bulbs as diverse as the artists who created them! This entry was posted in Art and Artists, Newburgh, Orange County, Public Art and tagged Gerardo Castro, Newburgh, Newburgh Illuminated, Orange County on June 21, 2013 by hudsonvalleygal. Peekskill’s oldest church dominated Drum Hill when it was constructed in the 1840’s. Its spire, once visible for miles, has since been overshadowed by Drum Hill School and cramped by the congestion of today’s urban Peekskill. This entry was posted in Churches, Peekskill, Westchester County and tagged Churches, Drum Hill, Oblong of the Hudson, Peekskill, Westchester County on June 13, 2013 by hudsonvalleygal.